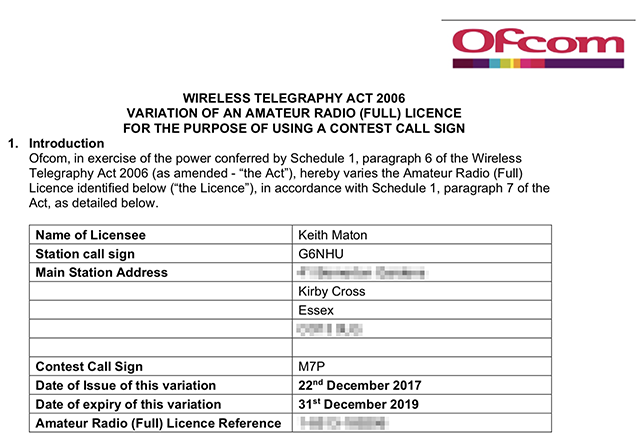 In 2013 I was issued a Special Contest Callsign (SCC) and used it very successfully for a number of contests which you can see on my Contest results page. Because I wasn’t active in the qualifying contests very much after that, I couldn’t renew it when it expired at the end of 2016. Part of my inactivity was due to the problems I had with interfacing the radio to the computer which I resolved last year. After entering a few contests in 2017 I realised that I’d probably got enough points to be able to renew my SCC. It took some scrabbling around and looking up my old results to confirm that I was just one point away from being able to renew. Towards the end of December the results from the WAE RTTY contest were posted and my result gave me two points towards my callsign. I submitted my application at 20:38 on the 21st December and at 14:38 on the 22nd December I received the NoV for M7P. There are some good reasons to have a Special Contest Callsign – Being only three characters, they’re quicker to use in all modes and are far more distinctive. A very nice bonus is that if you pick one of the more unusual prefixes then they’re quite rare. Some contests use prefixes as multipliers and people will generally be looking to work as many multipliers as they can. It’s nice to have a relatively rare prefix. I’ve given it a quick airing this year and just made around a hundred or so QSOs in various contests, giving away a few points. It’s nice to have it back again. You can find out more about Special Contest Callsigns and how to apply for one (if you qualify) here. This entry was posted in Amateur radio, Contesting. Bookmark the permalink.